Own a 4WD? This one’s for you! Tyre pressures in 4WD are incredibly important, even more so than that on a sedan or hatchback. The air pressure in tyres affects your 4WD in different ways. With the right 4WD tyre pressure on the road, you can enjoy a smoother ride and ensure that your tyres are in good condition. If you are wondering what tyre pressure for a 4WD is ideal, the following guide is sure to help. Choosing the right tyre pressure is vital and requires consideration of a number of factors like the vehicle and driving conditions. Be it the tyre pressure for 4WD on a highway or the 4WD tyre pressure on the sand, the correct pressure varies in different terrains. Mobile Tyre Shop will go through the differences and ways to avoid getting stuck in the sand! Lowering your air pressure in your 4WD is important when driving off-road. Having the correct PSI for 4WD tyres can enhance your vehicle’s performance and also prevent tyre damage. Traction is king when you’re planning to go off-road. If your vehicle can’t gain traction, then you won’t be going anywhere fast. The idea behind lowering your air pressure when off-roading is that by letting down the tyre you are allowing the tyre to expand at the bottom, giving you more surface area of the tyre touching the ground. This makes a huge difference when off road and allows you to get through areas thata fully inflated tyre could not. Another great example of why you need to lower your tyre pressure is when you are heading into a muddy area off-road. By extending the surface area that your tyre your vehicle is less likely to sink into the mud as the weight of your 4WD is more spread out. 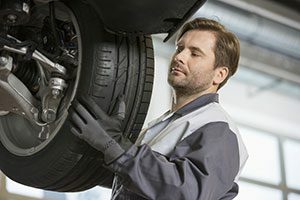 Mobile Tyre Shop repairs puncture every day out on Australian roads, in 4WD’s­­ however, there are a few ways you can minimise the risk of getting a puncture when off-roading. Tyres that have a high pressure are more susceptible to punctures as the rubber has expanded on the tyre. However, if the tyre pressure is reduced it can then roll over sharper objects such as rocks without a puncture. 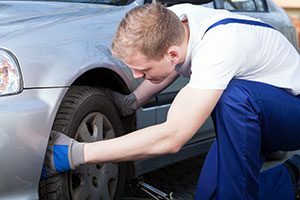 So what is the right tyre pressure? Tyre pressures depend on what type of terrain you are driving on and the conditions you are in. If you are looking for an off-road tyre pressure chart to set the correct pressure in your tyres, a general rule of thumb is that if you plan on driving fast then you should have a higher tyre pressure and if you are going slow and off-roading/going over rough terrain then you should have a lower pressure.